Saadia had a hard life growing up in a small village in Pakistan and witnessing the repeated abuse and torture of her mother at the hands of her father. Things did not get any better for her as a young woman, when still in her teens, her father announced that he had arranged a marriage to a wealthy older man who could give her father a good dowry. The abuse began on her wedding night, resulting in her ending up in the hospital. “Sadly, this was just the beginning of my abuse,” she said. Her only solace at the time was that as a teenager, her grandparents had provided her with the opportunity to go to school and earn a college degree and she treasured her education greatly. As the years passed, she gave birth to a child and she graduated from law school. Also during this time, she discovered that as the spouse of a U.S. citizen, she had the right to obtain a green card and immediately began the process, without her husband’s knowledge. She found that to be true, and with financial assistance from her husband who had remained in Pakistan, she was seeing a bright future ahead. That is until she learned of his death and the support stopped coming. With nowhere else to go, Saadia turned to distant relatives in Virginia to once again start a new life. It was there she was introduced by relatives to a family friend who she was told was a good man she could trust. He immediately took an interest in her, and although she was hesitant to get into another relationship, she quickly fell in love with him and they married. But she was stronger this time! “Because of my harsh past, I knew I was not going to expose myself and child to the horrors of yet another household of domestic violence,” she said. As many victims of domestic violence must do, she made the difficult, but necessary, decision to leave him, even though that meant homelessness for her and her child – but it was better than living in pain and fear, or worse. “For a long time, I was stripped away from everything except one thing, my education and my knowledge,” says Saadia, who after spending months living in a shelter for survivors of domestic violence is now a client of Safe Places, who is helping her rebuild her life for a third time, this time for good. As we at Safe Places have gotten to know this dedicated and determined young woman who has overcome much trauma in her life only to rise stronger than ever, we have no doubt her dream will soon come true. This would not be possible without the contributions from the supporters of Safe Places who helped provide her with what she needed most at a dark time in her life, a safe home where she can raise her child without worry and fear. 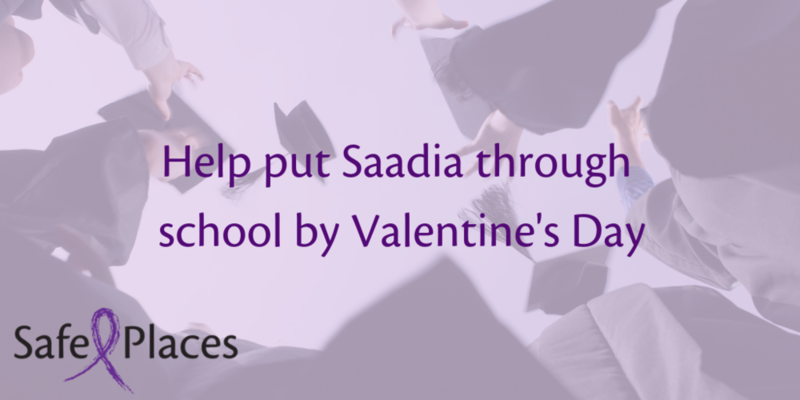 Saadia's tuition is $5,448 and we can think of no greater gift than that of education and financial security for her and her child for the rest of their lives. Her tuition is due February 14th. What's a better way to show your love on Valentine's Day than to give a mother the gift of self-sufficiency?